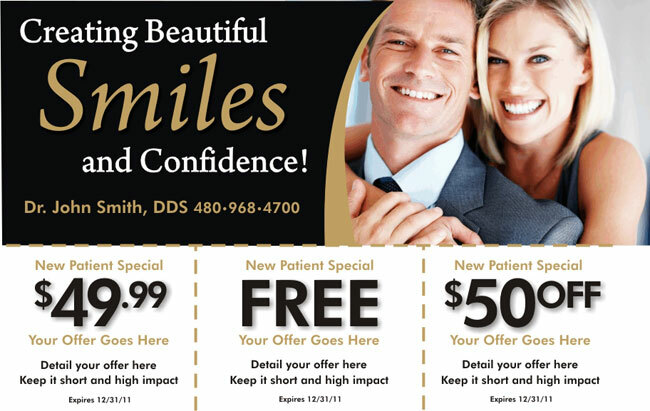 Postcard marketing often tends to lack the personal feel of a phone call or face-to-face interaction. When creating a direct mail postcard campaign, try putting a photo of one of your employees (or sales reps) on the back. Make the card seem like it’s coming directly from that person. Studies have shown that these pictures nearly always boost response rates — and not just for postcard marketing. Emails, brochures, even TV commercials generate better results when they include a real person presenting the offer. Faceless 800 numbers often intimidate customers, even if they don’t directly realize it. Almost instantly, that customer has decided they won’t respond right away. But behind that decision is the thought of calling your office, explaining the promotion (possibly to someone who won’t even know about it), waiting on hold, being redirected to others in office, and then re-explaining everything again. Putting one picture of an employee in your postcard market eliminates the possibility of that thought process occurring. It doesn’t have to a large photo. Just a small mug shot on the back and some contact information. To make it extra personal, include the person’s phone extension and email address. In all marketing — not just promotional postcards — the slightest personal touch goes a long way. The Ultimate Postcard Marketing Success Manual: Increase Sales & Boost Branding – All for the Price of a Stamp! Postcard Marketing: How Often Should You Mail? Postcard marketing often tends to lack the personal feel of a phone call or face-to-face interaction. Learn a simple technique can skyrocket your postcard's response rates.